Non-Surgical Facelift & Sculpting! 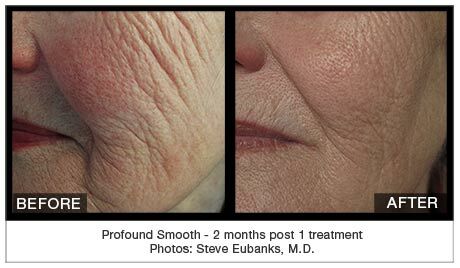 Manage Sagging Skin, and Wrinkles with Profound®. Clinically proven to recreate the skin’s building blocks (elastin, collagen and hyaluronic acid), the Profound® device yields 100 percent response rate. Using radiofrequency, this device helps rejuvenate and revitalize the skin by heating the sublayer tissues to a precise temperature for a specific amount of time. 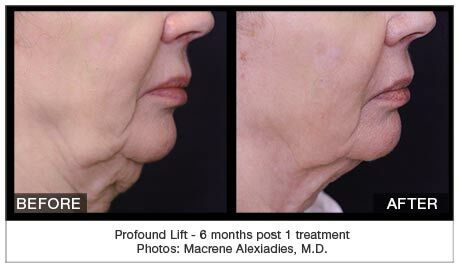 Unlike other non-surgical facelifts, the Profound® Lift is very noticeable even after a single treatment. With no incisions, the procedure uses the non-ablative RF heating device to precisely elevate tissues such as the brow, cheek, eye region, jowl and neck. Syneron Candela’s advanced technology allows our patients to achieve up to 50 percent of a traditional facelift completely without incision. A Profound® Lift typically takes around 45 minutes and uses six needles inserted 8mm deep,heated to a temperature of 67 degrees for three seconds to stimulate the collagen and elastin production. As we age our skin loses its elasticity which can often lead to the sagging of the skin around the chin. Using the same Profound® technology, we can lift and tighten this problem area often referred to as a turkey neck. What happens during a Profound® treatment? All Profound® treatments can be done in our clinic under local anesthesia. The total treatment time can last from 45 minutes to one hour. Lidocaine gel is applied to the skin to provide a numbing effect. The skin is then cleaned and local anesthesia is injected. The procedure is then begun once the face is completely numb. 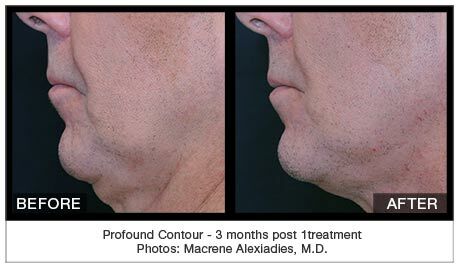 At Guelph Facial Plastics, all Profound® treatments are performed by Dr. Brace with the help of his team. What to expect after a Profound® treatment? Seven to ten days of downtime will be required post-treatment. Patients are encouraged to consider the timing of their procedure to ensure they can meet all the aftercare recommendations. For the first 48 hours, patients should sleep with the head elevated to minimize any swelling. Common side effects of Profound® treatments include: redness, swelling, bruising, some discomfort, and possibly small bumps and pinpoint bleeding. The treatment area must remain clean and moisturized for the first two weeks. Patients are recommended to use a mild cleanser two times a day and a healing moisturizer four times a day. Avoid the use of retinol or topical acids for at least seven days and the use of makeup for at least 48 hours. For optimal results, use an SPF of 30 or higher continually on the treatment area for the first month (although we recommend continual use always).